The Community Fisheries Network currently includes 15 organizations in Alaska, Oregon, California, Maine, and Massachusetts. 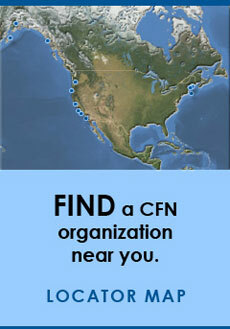 Our goal is to expand the Network to include interested organizations from fishing communities from across the country. The Alaska Jig Association (AJA) is a community-based organization that provides a unified political advocacy platform and serves as a marketing association for Alaskan jig fishermen. See more. The Alaska Longline Fishermen's Association (ALFA) is a nonprofit association of independent commercial longline vessel owners and crewmembers who are committed to continuing the sustainable harvest. See more. The Alaska Marine Conservation Council (AMCC) is a community-based organization dedicated to protecting the long-term health of Alaska's oceans and sustaining the working waterfronts of Alaska's coastal communities. See more. The Cape Cod Commercial Hook Fishermen's Association is a nationally recognized, non-profit organization that works to develop and implement creative solutions that promote healthy marine ecosystems, strong fishing businesses and thriving coastal communities. See more. Commercial Fishermen of Santa Barbara, Inc. (CFSB) is a 501(c)(3) community-based fisheries organization dedicated to providing fresh local sustainable seafood to our community. See more. Established in 2012, the Central California Seafood Marketing Association (CCSMA) is a non-profit fisherman's cooperative marketing association based in Morro Bay, California. Our mission is to build value and security for our members, their local fishing operations, and their seafood products. See more. Local Catch Monterey Bay is a Community Supported Fishery (CSF) that supports local fishermen and the working waterfront by providing weekly deliveries of seafood shares to individuals and families in our community. See more. The Maine Coast Fishermen's Association (MCFA) identifies and fosters ways to restore the fisheries of the Gulf of Maine and sustain Maine's historic fishing communities for future generations. See more. The City of Morro Bay's Harbor Department is a service-oriented organization providing boater assistance, emergency response, code enforcement, and facilities maintenance for the waterfront and the waters of Morro Bay. See more. Penobscot East Resource Center has been committed to building marine stewardship at a local, community level. See more. The Port Clyde harbor in midcoast Maine shelters the last small-boat groundfishing fleet between Port Clyde and the Canadian border. See more. Established in 2001, the Port Orford Ocean Resource Team (POORT) is a nonprofit organization based in Port Orford, Oregon that is dedicated to maintaining access to natural resources by people who are fishing selectively while promoting sustainable fisheries and protecting marine biological diversity. See more. The San Diego Fishermen's Working Group (SDFWG) is a nonprofit organization comprised of fishermen from the ports of San Diego representing five major fishing gear types – including trap, dive, net, experimental, and hook & line – that harvest approximately 28 different species of fish. See more. Established in 2010, the SFCFA is the first community fishing association on the West Coast. Its members are the fishermen whose family-owned boats call San Francisco's Fisherman's Wharf home. See more. The Community Development Partnership nurtures a vibrant Lower Cape region by promoting environmental and economic sustainability, expanding opportunities for low- and moderate-income residents, and preserving our unique cultural and historic character. See more. Ecotrust's mission is to foster a natural model of development to create more resilient communities, economies, and ecosystems. See more. The Island Institute is a membership-based nonprofit organization based in Rockland, Maine that serves as a voice for the balanced future of the islands and waters of the Gulf of Maine. See more.